Just three months after an embarrassing policy reversal by the Federal Reserve, investors are now sure they understand both what the central bank has planned and what will happen to inflation and the economy. In short: nothing much, according to a commentary in the Wall Street Journal. There are legitimate questions to be asked about whether widespread pay raises might translate into inflation, whether the first-quarter slowdown could be an early warning of a recession and whether the Fed really will stay on hold all year. But the market isn’t asking any of them. Instead, complacency is setting in around views of the Fed, showing up in record-low Treasury volatility and an unusual degree of agreement among economic forecasters. In one way, the market’s broad view was shown to be right on Wednesday, when the Fed abandoned plans to raise rates this year and cut its growth forecast, while saying quantitative tightening would finish earlier than planned. The Fed also dropped its forecast that the economy would overheat and it would need to push interest rates temporarily above their long-run sustainable level. But investors are going much further. The new low in implied volatility for bonds shows that investors are confident enough to forgo insurance, via derivatives designed to profit when there are big price moves. Not only will there be no surprises from the Fed, there will be no surprises from the economy, either. The calm is expected to last, too, with Merrill Lynch’s measures of implied one-month, three-month and six-month volatility for Treasurys all lower than in the tranquil period before the 2008 financial crisis. Investors think that, after the Fed’s screaming reversal in January, it would be embarrassing for it to change course again, so it would take a truly monumental economic or inflation surprise to make it act. The Fed’s new reaction function is that it won’t react, according to the commentary. *The views expressed in this commentary are from the author/publication cited, are meant for informative purposes only, and are not an official position of ABI. The Federal Reserve delivered yet another dovish surprise for financial markets: The dollar sank the most in nearly two months, Treasuries posted their biggest gain in over a year and stocks … didn’t do much of anything, Bloomberg reported. Financial firms in the S&P 500 sank the most in more than two months after Jerome Powell’s central bank held rates steady and signaled it intends to keep them there through at least the end of the year. The group of lenders and insurers, which account for 13 percent of the benchmark index, swooned as the 10-year Treasury yield plunged to the lowest in more than a year and the difference between yields on short- and longer maturity debt flattened. The pain was most severe for regional lenders that rely more heavily on interest income than diversified banks. The KBW Bank Index sank 3 percent, the most since Dec. 4, with all 24 members down at least 1.7 percent. Goldman Sachs Group Inc. slid 3.4 percent for the biggest drop in the Dow Jones Industrial Average, while all 22 insurers in the S&P 500 finished in the red. More than 200 firms in the S&P 500 are now expected to earn less than they did a year ago, data compiled by Bloomberg show, more than were in the same boat three years ago during a stretch generally viewed as the worst profit recession of the bull market. Average investors have found a turbocharged way to bet on the growing leverage in corporate America: business development companies, according to a Bloomberg analysis. The question is how the wager will do when the economy hits the brakes. That nervousness was clear on Wednesday, when shares of some of the best-performing BDCs, which are publicly traded vehicles that invest in highly indebted companies, fell slightly on the news that the Federal Reserve was unlikely to raise interest rates further this year. Even with that dip, BDCs have been a sleek vehicle for investors to profit from growth in corporate debt. The Wells Fargo BDC Total Return Index is up 14.3 percent this year, nearly double the 7.2 percent return of the iShares iBoxx High-Yield Corporate Bond ETF. Leveraged loans, too, are up just 4.3 percent in 2019. All but one of the 42 BDCs tracked by the Wells Fargo index are up this year. While BDCs are public companies, they are essentially investment funds. They take the money they raise from shareholders and buy loans, typically corporate ones, and often use debt to fund leveraged buyouts or other transactions. So this may seem like an odd time for the shares of BDCs to be soaring. Corporate debt has essentially doubled since the financial crisis. Buyout leverage ratios are higher than they have been in a while. And more and more people are warning that a growing number of companies could have trouble paying back their loans. Although Democrats complained that $5.7 billion for a border wall was too expensive, that’s chump change compared to what many of the congressional Democrats and many of the declared presidential candidates are rallying behind, according to an opinion in the <em>Boston Herald</em>. The price tag isn’t in the billions but in the tens of trillions. President Trump was attacked for a budget blueprint that would run fiscal deficits of 5 percent of GDP. That’s too high, but count up the spending plans of Democrats, and deficits could easily hit 20 to 30 percent of GDP and tilt the nation toward Greek- and Puerto Rican-style bankruptcy, according to the opinion. “Medicare for All” is being touted as a way to make medical services “free” for everyone. The cost to taxpayers? By some estimates, $32 trillion over the next decade. Medicare is already projected to run deficits in the tens of trillions of dollars over the next four decades. The Democrat-backed welfare programs in the Green New Deal are even more daunting. According to the study, “guaranteed jobs” and “universal health care” would together cost each American family as much as $582,000 or $80.6 trillion in total. Then there is the loss of as many as 10 million jobs in the oil, gas and coal industries, which would add to welfare and unemployment benefit costs, let alone the severe financial hardship this would impose on millions of middle-class families. Added together, these preliminary Democratic proposals are projected to cost about $92 trillion over 10 years. *The views expressed in this opinion are from the author/publication cited, are meant for informative purposes only, and are not an official position of ABI. 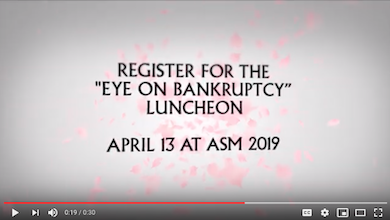 ABI's ASM this April features 30 sessions with expert speakers analyzing important bankruptcy cases and issues. ABI's Commission on Consumer Bankruptcy will release their final report of recommendations to improve the consumer bankruptcy system. Legendary journalist and author Bob Woodward will provide the keynote. These are just some of the many reasons to join the 700 already registered for ASM. Register here. The role of the central bank has changed over the decades, but presidential pressure on the Fed has been a constant, according to a recent blog post.